This was day two of my east coast Rush tour. I found it difficult to get out of bed, as did Monica. Something about being three hours ahead definitely throws off your system. Monica got up, showered, and brought me the dregs of the continental breakfast, and we were in the car by 11:30 or so. 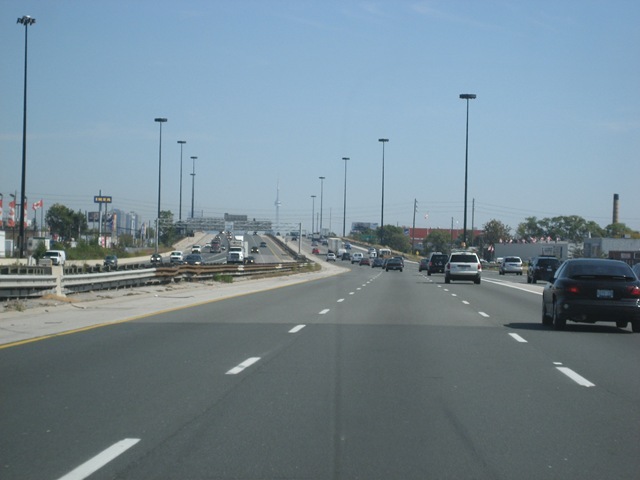 Once we got through the Canadian border (about a 30 minute wait), we drove on the QEW to Toronto. 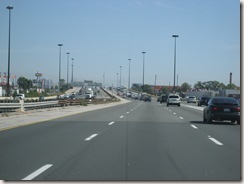 On this highway, we passed through Neil Peart's home town of St. Catherines (Port Dalhousie), although we didn't stop. We were in Toronto by 3:00 p.m.
As you drive closer to Toronto, the spire of the CN tower is like a beacon to the city center. As you get closer, you see a huge windmill churning near the waterfront. I guess even though I knew Toronto was on Lake Ontario, I never pictured it with a waterfront in my mind's eye. As we drove into Toronto, the big-city energy that I've only felt in cities like San Francisco, Boston, and Vancouver, B.C., grew stronger. On Yonge Street, the longest continuous street in the world, the city seemed to become like what I've imagined New York or Chicago to be (I've never been to either of those cities). Crowds of people waited on corners for lights to change. Cars honked and pushed up the street. Buildings towered overhead. Then we arrived at our hotel, the downtown Day's Inn. 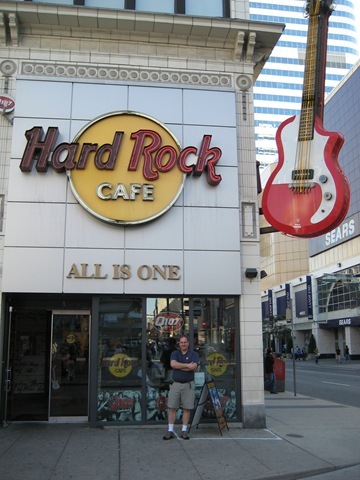 After checking with the hotel (we couldn't check in until around 4:00 or so), we walked down Yonge Street to the Hard Rock cafe. We were hoping to be able to sit in the booth next to Geddy Lee's bass, but a couple was already sitting there. While Monica and I ate Hard Rock hamburgers, we looked around at all the music memorabilia that makes the Hard Rock famous, including an Alex Lifeson Paul Reed Smith guitar. 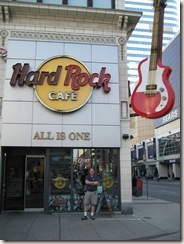 When we walked into the gift shop, I noticed a glass booth next to the exit with a Q107 logo. Monica pointed out that Kim Mitchell, of the Canadian band Max Webster (who opened for Rush in the 80's), was one of the DJs sitting in the glass booth. When a fan came by with his family and knocked on the glass, Kim was all too happy to come out and sign his shirt and talk. What a cool guy. Outside the Hard Rock, I took in Eaton Square, which is the closest I've ever come to something like Times Square. Huge TVs and billboards create a vortex of information that was both hypnotic and disgusting. 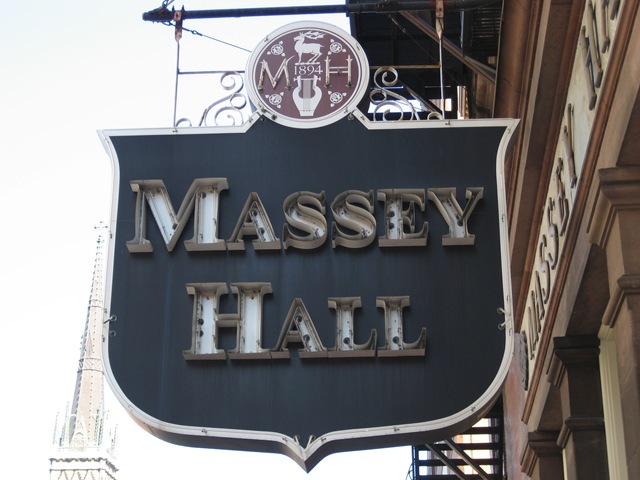 After lunch, Monica walked me over to Massey Hall, where Rush's now-famous first live album was recorded, "All the World's a Stage." The hall itself is medium-sized, with old-world brick architecture (the hall was built in 1894). Other than the first live Rush album being recorded there, I don't know much about the hall. 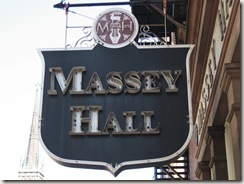 I did see that current bands playing Massey included diverse acts like John Scofield and Kelly Clarkson. 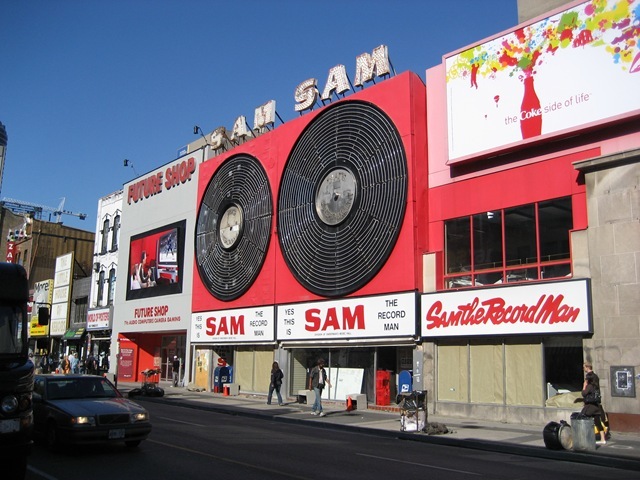 The venerable record store headquarters for Sam the Record Man was located in Toronto until earlier this year, when it went out of business. 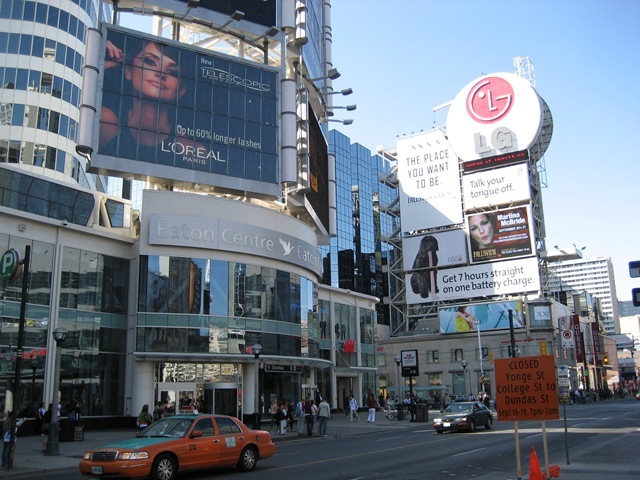 Sam's had not only been a fixture on Yonge street, but had been one of the early forces in helping Rush gain an audience. Fortunately, the famous building front hasn't been torn down yet. 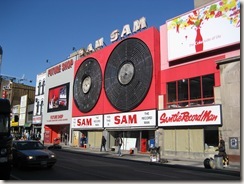 While I know the record industry is in the midst of a sea change, its sad to see stores like Sam's go out of business. 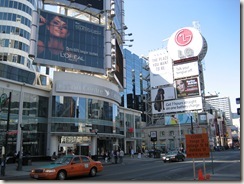 On the way up Yonge Street, past Sam's, I noticed a lot of Hollywood-style camera lights and barriers. I asked an official-looking woman with a laminate around her neck what they were filming, and she said, "The Incredible Hulk." Evidently, Edward Norton is David Banner in this one. While I find it odd that they're making another Incredible Hulk, after one was released with Eric Bana only in 2003, I do like Edward Norton (who also worked on the screenplay for this movie). 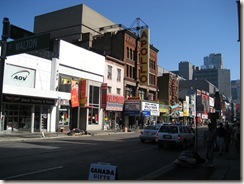 As with many American movies, Toronto is a stand-in for New York for "Hulk" -- and many of the storefronts on Yonge Street had been transformed into Harlem. I hadn't even noticed the Apollo Theater replica -- but if you've never seen a city before, you wouldn't know the difference. I made a note to return to see them filming. 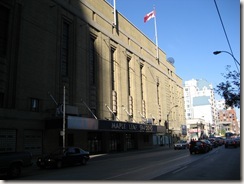 Monica walked me over to Maple Leaf Gardens, a famous hockey and Rush venue, that is now closed. Fortunately, the Gardens were right next to our hotel. 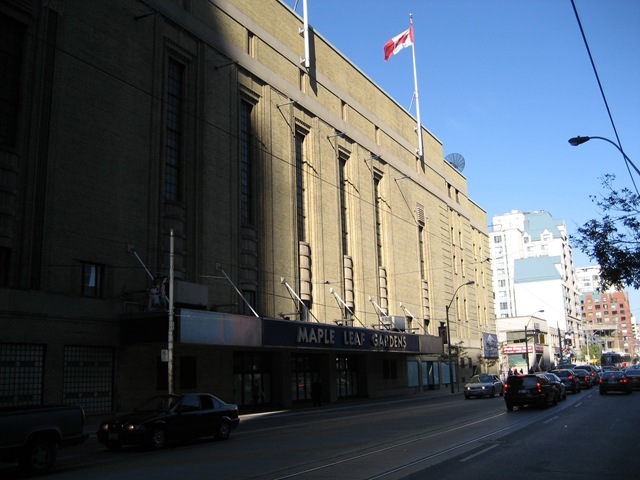 Back in the day, Rush would play two or three nights at this arena. But like so many of the arenas in the United States and Canada, they are being replaced with newer, state-of-the-art venues with luxury boxes, less leg room, and other things that make the owners a lot more money. After we took a short rest in our room (and checked in), Monica drove me by Anthem Records, the business office for Rush in Toronto. This is where the management of the band works, although there's nothing to indicate this on the outside. If you call ahead, you can request a brief tour of the office, which includes some album artwork and gold records. 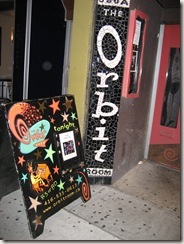 Then it was up to Alex Lifeson's bar on College Street called the Orbit Room. Being that it was only 8:00 p.m., it wasn't even open yet -- so we walked down the street and had a great Thai dinner. On the way back, we didn't go in the Orbit Room, as we knew we'd have to pay a cover for the band there and we were getting tired. We went back to the hotel and called it a night.